Entertain guests with this beautiful sophisticated dining set. The spacious rectangular table includes an 18" leaf to extend table length up to 78" to easily accommodate extra seats. High back side chairs feature a ladder back and upholstered seat and back for a unique contemporary touch. Finished in a beautiful dark brown hue. 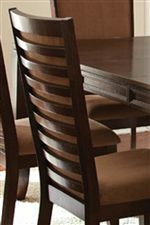 The Cornell 7-Piece Formal Dark Brown Rectangular Dining Table & Ladder Back Side Chair Set by Steve Silver at Walker's Furniture in the Spokane, Kennewick, Tri-Cities, Wenatchee, Coeur D’Alene, Yakima, Walla Walla, Umatilla, Moses Lake area. Product availability may vary. Contact us for the most current availability on this product.